The RA24-series non-spring return damper actuators with torque 24 Nm are used to regulate dampers up to approx. 6.0 m². The 24 Nm non-spring return damper actuators RA24 24D and RA24 220D are with control signal on/off (two-position) or 3-point (3-point flaoting / tri-state). 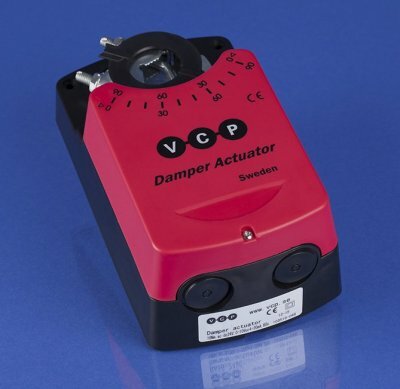 The 24 Nm non-spring return damper actuators RA24 24VC is with selectable control signal 0-10 Vdc or 4-20 mA. Auxiliary switches are equipped on the digital (on/off or 3-point) types of non-spring return damper actuators types RA24 24D S2 / RA24 220D S2 and on the analogue (0-10 Vdc or 4-20 mA) types of non-spring return damper actuator type RA24 24VC S2. Feedback signal is standard on all the 24 Nm non-spring return damper actuators RA24-series with analogue control signal. The 24 Nm non-spring return damper actuators RA24-series are equipped with position indicator, manual override by push button, direction of rotation changeable via switch on pcb. Running time for all 24 Nm non-spring return damper actuators RA24-series is 125 seconds. Control signal on/off or 3-point.